While I've always wanted to visit the city of Annapolis to see the rich Chesapeake Bay history and Naval wonderment, time unfortunately held me to a short pit stop. Wanting to utilize my time and cup of coffee wisely, I chose amongst several locations of a popular coffeehouse and roaster called Caffe Pronto. Having had several of their batches before at a couple different other coffee establishments, I have actually been aching to make a stop at one of their own stores to see how they wield their beans. Based purely on geographical proximity to the highway, I made a beeline for their spot amidst the humongous Festival at Riva shopping megalopolis. Wading through the immense mall traffic, I finally landed outside the corner shop with its beautiful huge windows and bright brick shell. In I walked into Caffe Pronto's open cafe, a very nice space with plenty of furniture and an overall very luminous atmosphere. As mentioned, they roast a mean batch of coffee and they brew their coffee by the cup via a pourover (aka manual drip). I ordered their Brazil Cerrado, a smooth earthy coffee with the sweetness of a pear, a touch of earl grey and a nice body; a pleasant coffee in totality. The espresso made for a pretty good cup, as the short/medium pull possessed decent crema and displayed a little like a chocolate-covered cherry with hints of dark bitterness. The tea is Revolution Tea. 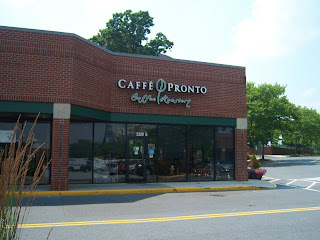 Including a pleasant interchange with both baristas, I really found my stop at Caffe Pronto to be a gust of refreshment. If you happen to be near a Caffe Pronto or one of their purveyors, give them a slurp. Despite the image change to Ceremony Coffee Roasters, this lone vestige of Caffe Pronto remains. The shop has been updated (I love the birch trunks behind the wood booths) and the coffee has improved categorically (hence the update in rating). Sorry, Kelly — Baltimore Coffee and Tea is barely a step up from Starbucks. If you can't make it to Caffe Pronto or City Dock Coffee for the real deal, you're better off getting your own from local roaster Cobblestone Coffee (www.cobblestonecoffee.com).